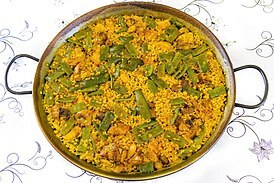 Paella Valenciana and its seafood variation originated in the early 1800s in Spain's Valencian region near lake Albufera. Prior to the 19th century, the ingredients for Valencian paella varied greatly with the most unusual being marsh rat. Note: Throughout history, saffron has been the natural ingredient used in Spain to color rice yellow. However, it's very expensive (a pound costs over US$1,500) because it's labor intensive to process and each saffron crocus yields a minuscule amount of saffron. Consequently, supermarkets sell only a few grams per container for three or four US dollars. The best solution to this problem is to use commercially manufactured food coloring containing both natural and artificial ingredients (but usually no saffron). The two most popular US brands are Bijol and Badia. These companies sell containers each holding several ounces of coloring for less than five US dollars. After 10 minutes have passed, you should have a flavorful broth. It's customary at this point to allow your dinner guests to taste it. The purpose is to determine if the broth needs more salt. If so, add more salt, a pinch at a time, until everybody is satisfied. Add the rice and stir it using the rice skimmer. Then, once again with the skimmer, spread it over the bottom of the paellera. The coating of rice should be one centimeter thick. Let it cook over a high flame for 10 minutes. Then reduce the heat to medium and let it simmer for four minutes. Add the canned haricot beans and reduce the heat again to low and let it simmer for another four minutes. Taste the rice about once every four to five minutes. You'll know it's done when it's slightly firm to the bite. Italians use a similar approach when cooking pasta. Italians call this texture al dente.